Three days ago we reported on a devastating issue plaguing EVGA’s Nvidia GeForce GTX 1080 & GTX 1070 cards causing them to catch fire. The issue centers around the voltage regulation modules inside EVGA’s dual fan GTX 1080 and GTX 1070 cards which are very susceptible to overheating. Primarily due to a design oversight which left them without any proper cooling. The extreme thermal conditions these VRMs are subjected to overtime ends up in them failing, often in a dramatic fashion, engulfed in flames. EVGA Nvidia GeForce GTX 1080 and GTX 1070 owners have been reporting instability issues, occasional black screens and hardware failures over the past couple of months. The issues led to investigations which have pin-pointed the voltage regulation circuitry as the culprit behind the electronic gremlins that users have been complaining about. The issue affects all of EVGA’s dual fan Nvidia GeForce GTX 1080 and GTX 1070 cards except the Classified. These include the GTX 1080 and 1070 ACX, SC, FTW and FTW DT models. More recently, owners took to EVGA’s forum as well as reddit to report incidents of their graphics cards catching fire and dying. One such incident, in fact, has been recorded on video. 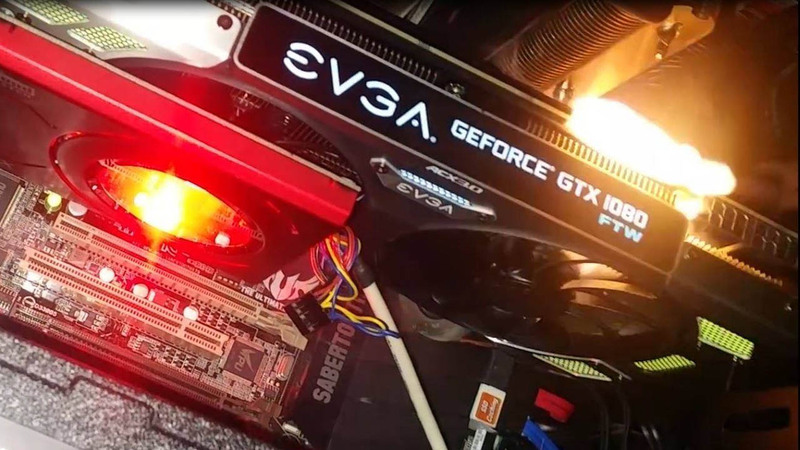 The video shows the VRMs of an Nvidia GeForce GTX 1080 EVGA FTW card suddenly going up in flames. This footage, taken by Michael Duncan, is the first that we know of which documents the infamous event some EVGA owners were unfortunate enough to experience themselves. Speaking to Wccftech.com Mr. Duncan said that his EVGA GTX 1080 FTW had been working without issue for one month prior to the incident. One day, however, he came back home to find that all of a sudden his machine would no longer boot up when he attempted to turn it on. He began troubleshooting his machine, testing one part at a time, when he caught the ill-fated incident on camera. You can clearly see in the video that the auxiliary 8-pin power connectors were not plugged in for the purposes of troubleshooting. Although that in no way prevents power from going to the graphics card vie the PCIe slot. Which is why we clearly see the LED lights and the fans turning on before the VRMs suddenly went up in flames. Mr. Duncan confirmed that while troubleshooting, and before the graphics card had caught fire, the computer failed to boot up whenever the graphics card was installed. Which would indicate that after a month of wear and tear, without proper cooling, the VRMs finally gave in and ended up failing without notice as they did. A scenario professional overclocker “buildzoid” explained is typical of these cases. If you want to find out more about the issue and what EVGA has done in response to address it, you should visit our original article where we explain all the details. I’m going to repeat what I had mentioned in the original article because I feel it’s really important. Users should find some relief in that EVGA was quick to acknowledge the issue. It admitted that the lack of VRAM and VRM cooling was an oversight and will cover any damaged hardware under warranty. The company has already taken steps to address concerns and is now installing VRM thermal pads in all graphics cards coming off the production line. Additionally, EVGA is also offering GTX 1080 and GTX 1070 owners a VRM thermal pad kit for free. Which you can apply for directly via the official EVGA website. Alternatively, you can send your graphics card directly to EVGA and they will install the thermal mod for you. With that being said, if you’re currently in the process of buying a dual fan EVGA GTX 1080 or GTX 1070 we would strongly advise you to hold off until the new revisions begin shipping. If you’re already an owner of a dual fan GTX 1080 or GTX 1070 from EVGA there’s really no reason whatsoever not to apply for the thermal mod. If you do not wish to install it yourself, send your card to EVGA and they will do it for you. There’s no reason to risk potential damage to your valuable hardware by leaving the VRMs without proper cooling.